This brand new home construction in Carmel, Indiana, was just finished. Our local Slide-Lok of Indianapolis gave this garage the full treatment — Full tech silver chip broadcast and polyaspartic coating. Another angle of this beautifully finished garage floor coating. 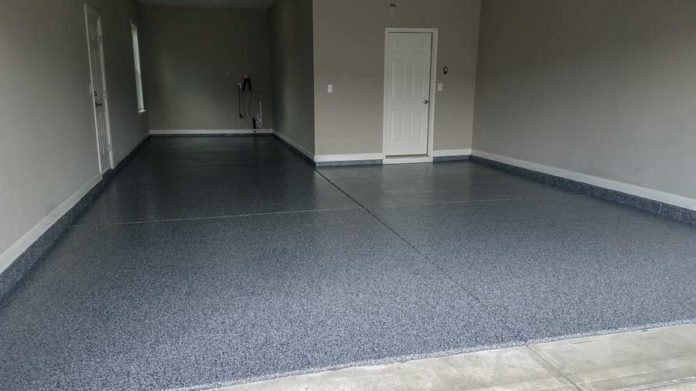 This brand new house got a brand new polyaspartic garage floor coating. Garage floor coatings installed in just 1 day! This before photo of this garage floor really shows you how big of a difference a garage floor coating makes in the appearance of your home. This new home featured fresh or green concrete that needed coating. Green concrete coatings. Another before photo of this brand new home shows off the brand new concrete garage floor. The concrete should be fully cured before attempting to coat it. Wow, look at those bare concrete stem walls! There’s nothing wrong with bare concrete. We just think it looks much better after it has been coated with polyaspartic! And another before shot of this Carmel, Indiana, garage floor’s stem walls. We grind all concrete that will be coated, even the stem walls so that our coatings can achieve excellent adhesion. Brand new 3 car garage floor totalling 614 sq ft! This retired couple, located in Carmel, Indiana, just moved from Michigan to be closer to their grandkids. They moved into a beautiful, BRAND new construction, home in a new subdivision. Immediately this couple knew they wanted to have their garage floor coated and reached out to our local Indiana Slide-Lok dealer. Lucky for them they were smart and hadn’t started jamming the garage full of boxes and possesions only to have to move them again. And there you have it, another satisfied customer! Just looking at the before and after photos for ourselves leaves us speechless, we really love seeing these transformations. Even for a brand new home like this the before and after photos are still amazing. What’s most surprising is that even on new homes that the concrete isn’t perfect. Thankfully our skilled installers know how to repair concrete so that it can be coated and provide a seamless, perfect finish. If you’d like your finished garage to look this good contact Slide-Lok Garage Interiors for your FREE ESTIMATE!